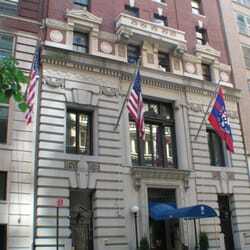 As a special benefit for our alumni, Brandeis University has established an affiliation with The Penn Club of New York in midtown Manhattan. A historic landmark, the 13-story clubhouse is conveniently located at 30 West 44th Street, between 5th and 6th Avenues in New York City. Club members also have access to approximately 150 reciprocal private club facilities worldwide. Club membership is open to all Brandeis alumni, parents of Brandeis students and alumni, Brandeis faculty and staff around the world. The Penn Club features a Beaux-Arts style clubhouse, where many Brandeis activities are held. Alumni members are welcome to join for access to 39 affordable overnight guest rooms, a fitness center, a massage room, six meeting and banquet rooms, two restaurants, two bars and member activities to encourage continued learning via lectures, networking and social gatherings. Members also receive discounts to Brooks Brothers, ZipCar, Hertz and Kaplan test prep courses. at 212-403-6627. Lower rates apply for young alumni members. Application and rates. Membership processing takes approximately two weeks.